Categories: Patterns/Surface Design, Products I Love | Tags: Gear, Headband, swim team, Swimmers | Permalink. Free Pattern: Sew a Super Deluxe Drawstring Backpack! Categories: Patterns/Surface Design, Sewing project | Tags: bag pattern, bag with pockets, drawstring bag, drawstring bag pattern, free pattern, free sewing pattern, pattern, patterns for swimmers, sew a bag, sewing for swimmers, Sewing project, spoonflowered, swim team, swim team bag, swimming | Permalink. Where are all the quilters? These fabrics would be great for a quilt for a swimmer. 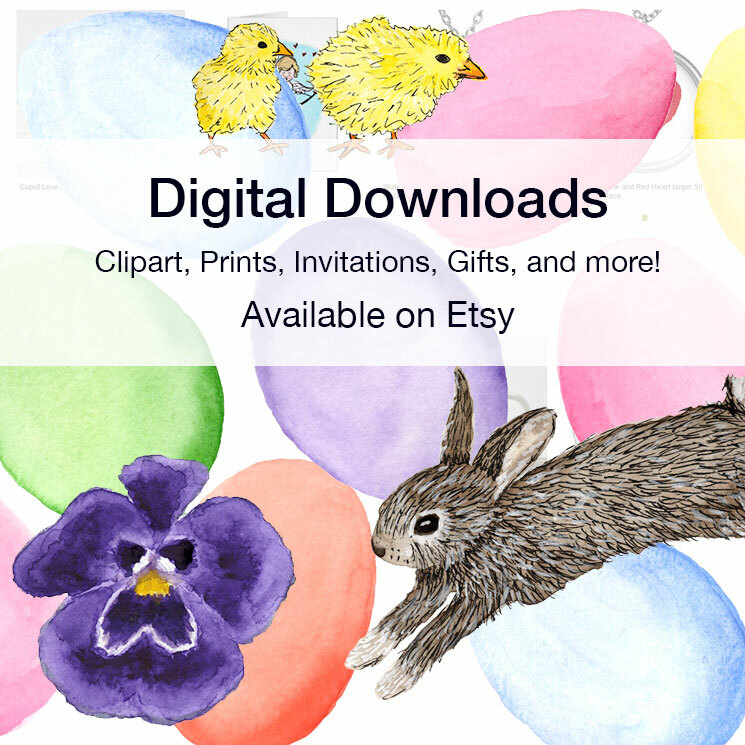 You can order them on Spoonflower, just click here to visit my Spoonflower shop. Categories: Patterns/Surface Design | Tags: goggles, pool, Pool themed, Quilt for swimmers, sewing for swimmers, Sewing project, summer fabrics, swim team, swimmer, swimming, swimming themed | Permalink. I have really fall in love with my sketchbook. For me, it isn’t so much a place to practice, but a place to come up with ideas and explore them. It is the epitome of no pressure, just playing. Often a new idea from my sketchbook becomes the inspiration for a painting or a pattern design. I’m trying to get back to a more regular sketching schedule. It leads to more paintings. If you are wondering where I’ve been lately, my business has really been picking up. It’s really exciting to grow and nurture something and see results. You can see my latest graphic design projects on my Facebook page or visit my website www.eileenmckenna.com. 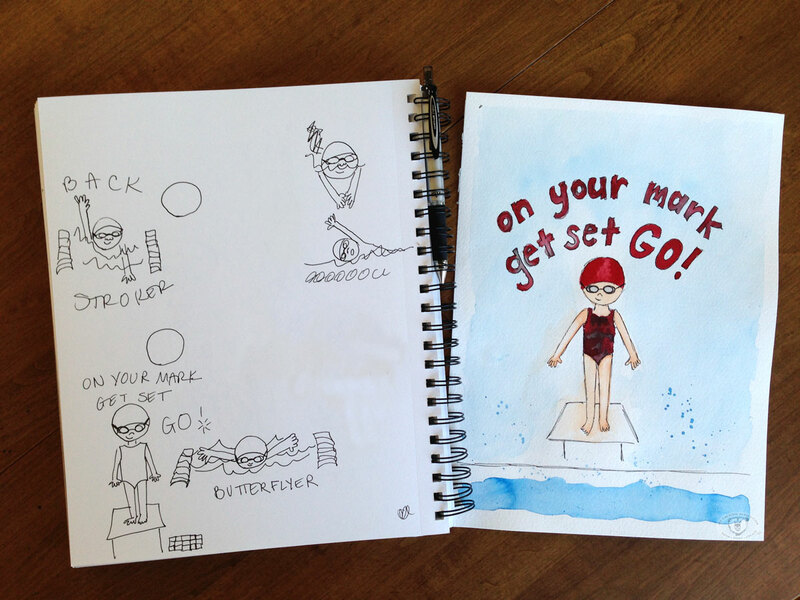 Categories: Inspiration, Sketch | Tags: graphic design, illustration, pool, Sketch, sketchbook, swim, swim meet, swim team, swimmer | Permalink. One thing I’ve learned about myself as an artist, is that I dive into a project with enthusiasm. I think it’s the Aries in me [read more about that here]. It’s great for starting a project, but for me, a couple of things can get in the way of finishing a project. A new project grabs my attention. I get worried about ruining a project. I’m not sure how to proceed because I haven’t planned things out. When I started my creative resolution I forced myself to finish a bunch of forgotten projects. I also forced myself to finished most of the new projects I started. And I adapted to work within my personality. Most projects I work on, I finish within a few days – before the enthusiasm fades or I get sidetracked (or I get paralyzed worrying about ruining it or I start to overthink the next steps). Recently I started this pool painting. I forced myself to paint, what I thought of as the hardest part of the painting – the lane lines – before I left for a short trip. I knew that if I could get that step out of the way and left only the pool water and a few minor details, I’d be much more likely to finish this painting when I got back. Some of the valuable lessons I’ve learned in the last year and half, have less to do with painting and technique, and more to do with how I work. And how to get things finished. 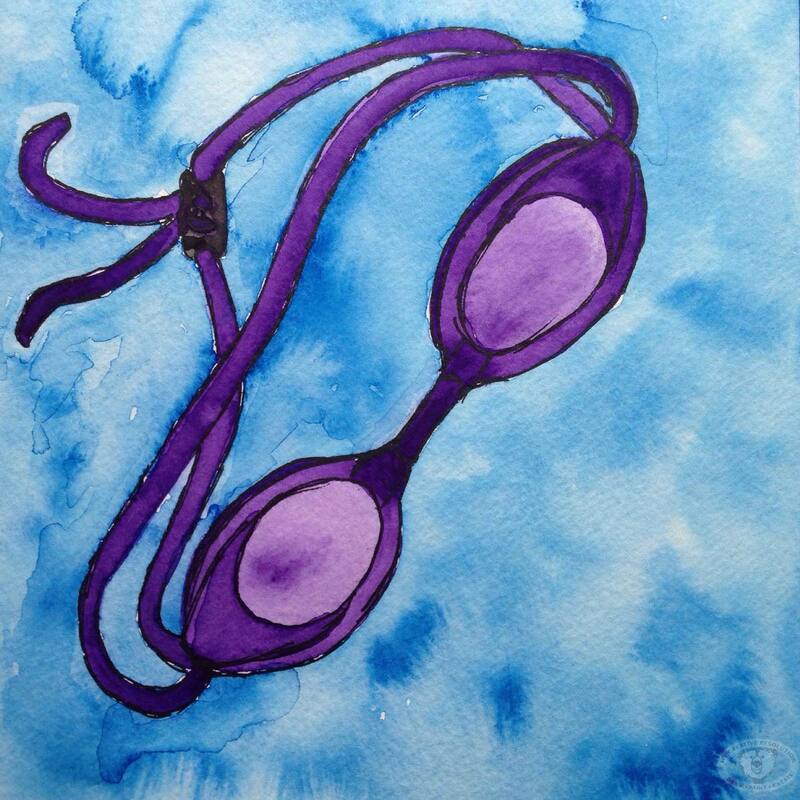 Categories: Resolution, Watercolor | Tags: Art, creative, Drawing, illustration, ink, paint, painting, pool, swim meet, swim team, swimming, watercolor | Permalink. 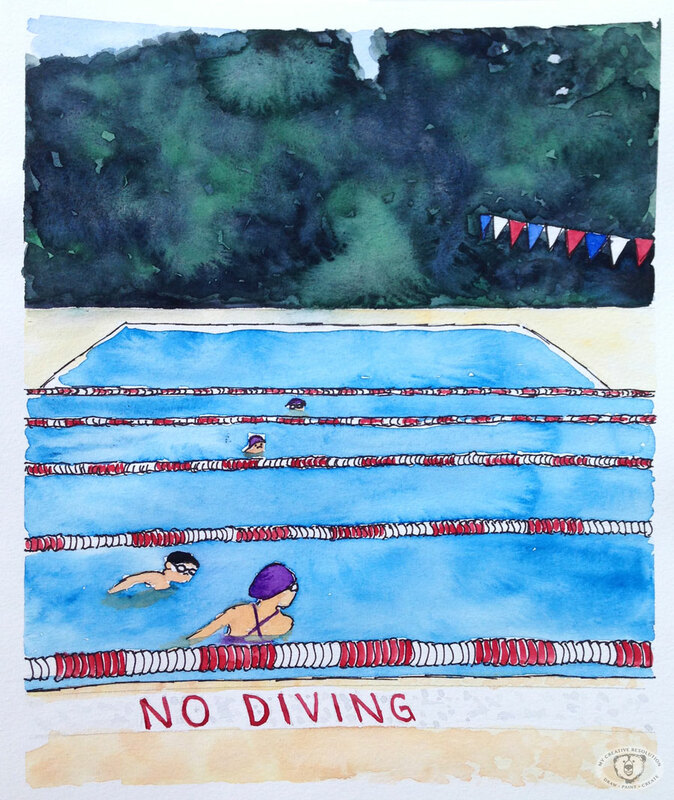 The town pool opens today! I’m looking forward to our local pool opening and swim team practice starting. Practice is early morning before the pool is open to the public. It’s pretty quiet while the kids are practicing. I usually sit and read. 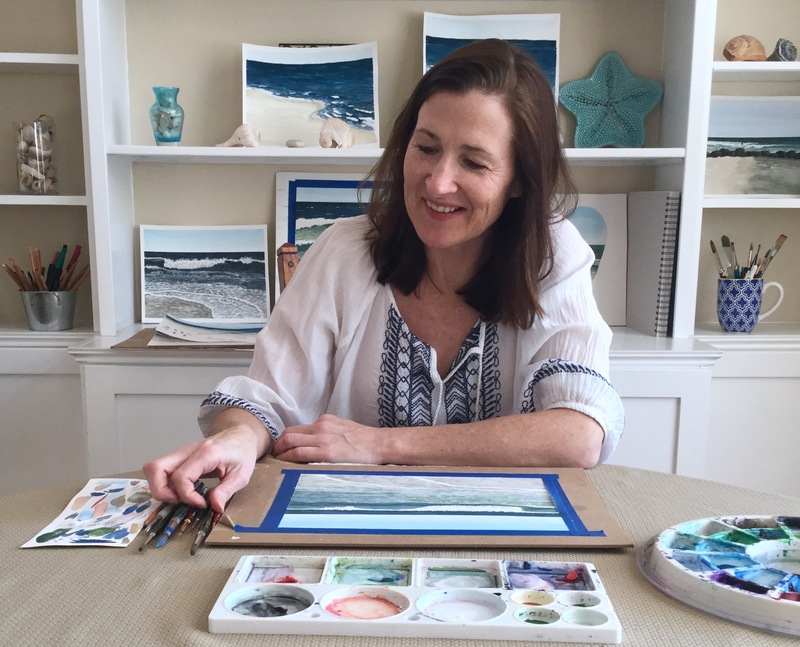 I’m a little shy about painting in front of others, but it would be the perfect time to sit and paint, with inspiration all around! So, you may be seeing less flowers and more blue in the coming weeks! 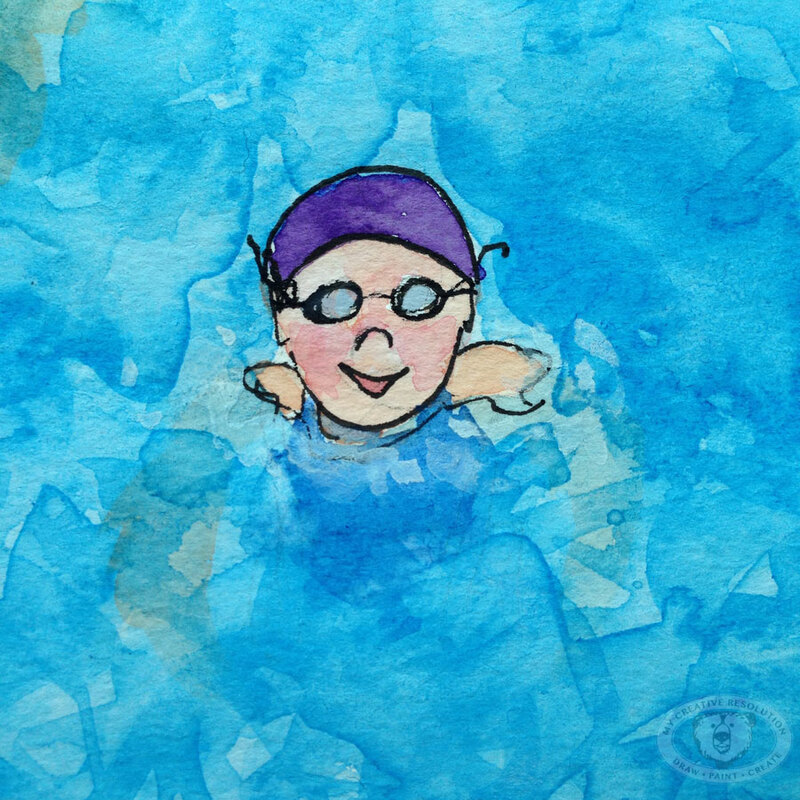 Categories: Inspiration, Pen & Ink, Watercolor | Tags: Art, goggles, illustration, painting, pool, swim, swim team, swimmer, water, watercolor | Permalink.